Twitter mailbag: Will Felix Hernandez pitch in the postseason if the Mariners make it? Cano to first base? And Magnum P.I.? Is Felix Hernandez listening to what the Mariners want to do? 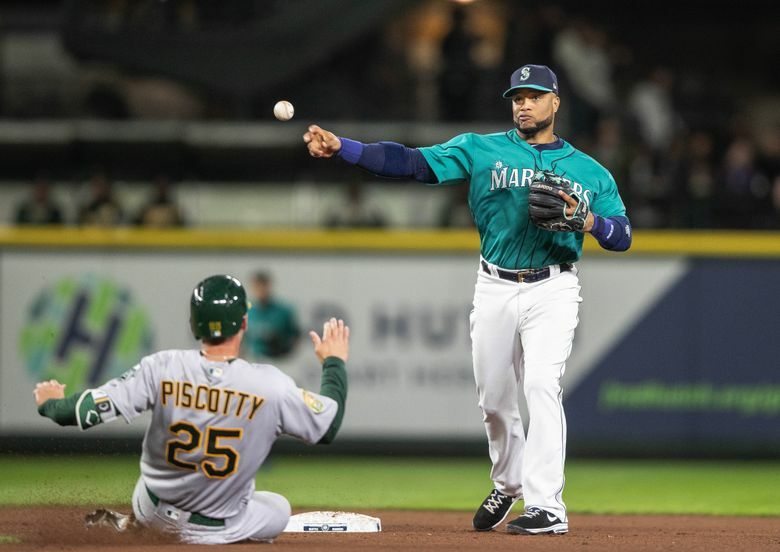 Will Robinson Cano play first base this season? The difference between Daniel Vogelbach at Class AAA vs. the big leagues. Does team chemistry affect decisions on trades? ANAHEIM, Calif. — After a brief hiatus, the Twitter mailbag is back for another exciting session of asked and answered questions about the Mariners, baseball, the existence of life and apparently 1980s television series. These are real questions from my eclectic mix of Twitter followers, who are passionate to the point of amusing and at times terrifying. I’d like thoughts on Felix. Is he following coaching and catching recommendations or trying to be something he isn’t? Sad thing is I can’t imagine pitching him in any playoff game even to give him a first. Hernandez’s season of ups, downs, runs allowed in the first inning, command issues, modified warmups and changed routines has made him into a pitching version of Hamlet, a tormented royal with a constant inner conflict of who he once was versus who he has to be going forward. His outing — good or bad — will always be the focus on any game he starts. To be honest, I got a C in my college class on Shakespeare. And at the time of writing it, I wasn’t certain if the simile was stupid or a sign of staring at my computer for too long. But Hernandez’s current status on this Mariners team and that constant push and pull of King Felix vs. current Felix is fascinating and really not trending toward a happy ending. From everything I’ve been told by manager Scott Servais, pitching coach Mel Stottlemyre and catcher Mike Zunino, Hernandez is following their recommendations. Of course, he’s saying all the right things. But he’s done that before and then not really embraced the change. I do think his failures this season, including his struggles in the first inning, have forced him to finally understand that everything he’s done before won’t work because he’s not the same pitcher as before. Is he trying to be something he isn’t? Well, he isn’t the guy that won the Cy Young in 2010 or should’ve won it 2014. He’s not the guy that strikes out 200 batters in a season and pitches 200 innings. The easy crutch is to say it’s all about his diminished velocity, which has gone from 94.1 mph on his fastball in 2014 to 90.3 mph this season. But ask anyone with the Mariners or in baseball and Hernandez’s issue is command more than velocity. Control is throwing strikes. Command is throwing and manipulating the baseball to move and finish in the spot that you intend. For basically the last three seasons, the command of his pitches — most notably his fastball — has been something worse than inconsistent. When he was at his best, he knew how to use the explosive movement of all his pitches and place it just where he wanted. But inconsistencies with his mechanics and injuries haven’t allowed that. The Mariners have challenged Hernandez to use everything early in the game, save nothing and not be afraid of contact. They’ve asked him to condition more and return to throwing a mid-week bullpen as a way to find more repeatability of his delivery and mechanics. Then again, they’ve been asking this from him for the last few seasons. But after an awful outing on May 24, a humbled Hernandez went to Stottlemyre and asked for help. That was an important first step. What I found most interesting following his most recent outing was that Hernandez wouldn’t use the lower back issues he’d been dealing with for about 10 days as an excuse for poor results. But he did say, that he didn’t like not being able to do his mid-week conditioning or having to dial back his bullpen session because of the sore back. “I can’t wait get back to doing what I’ve been doing in between starts,” he said. That’s progress on some level. As for the second part of your tweet, the idea of Hernandez, the guy who stayed in Seattle and promised to deliver the playoffs to the city, not pitching in the postseason isn’t just real, but likely. If the Mariners get into the American League Divisional Series, it’s hard to see him getting a start in a five-game series. He could even be left off the postseason roster. The phenom, who blossomed into a star and earned a nickname of royalty, missing out on the one thing he’s spent his entire career trying to achieve because of his own failures and baseball mortality? It would be a tragic tale that Shakespeare might love. Will Cano play any 1st Base in 2018. At some point during his time with the Mariners, Cano was going to shift to first base. Usually that sort of transition due to age and declining defensive skill happens about a season after it should. But all of the circumstances changed this season when Cano was suspended for 80 games because of a violation of the MLB joint drug-testing policy. In his absence, Dee Gordon has been an exceptional replacement at second base in terms of defense. His range and athleticism and knack for the spectacular have some fans and former players now saying that the Mariners don’t need Cano back. The Mariners are a better team with Robinson Cano in the lineup. Before the positive test for a PED masking agent, Cano was considered on track for eventual enshrinement in Cooperstown. So, no, they aren’t better without him. But with Cano not being eligible for the postseason, the Mariners have to play Gordon at second base at least a couple of times a week to keep him ready for the possible wild card game. Even Cano, who met with the media on Saturday for the first time since his suspension, said the same. Cano planned to talk to Dipoto before he left for the Dominican Republic so he could work out for his return on Aug. 14. It’s likely that Dipoto told Cano to start working out at first base so he can be prepared to play there on occasion when he returns. After the press conference for Dipoto’s contract extension, he sat and talked to reporters. It’s one of the best aspects about his tenure as the Mariners GM — his availability to the media, his willingness to discuss subjects in a candid manner and doing all of that in complete sentences. He did mention chemistry a little when talking about acquisitions. And yet, talent matters. The Mariners could realistically use at least one more right-handed reliever if available. If the Mariners could somehow get a right-hander like Keone Kela, Brad Brach or the longshot Kyle Barraclough, that matters more than chemistry. Seattle has shuffled out plenty of relievers this season so it won’t be that detrimental. Heck, another lefty reliever might not be a bad addition as well. Many people would love to add a starting pitcher more than a reliever. But given what’s out there, it might not be worth the investment. Seattle doesn’t have the prospects to land Chris Archer of the Rays or even Michael Fulmer of the Tigers. The Mariners just signed Wade LeBlanc to an extension for next season. So their entire rotation is under contract for 2019. Seattle ownership didn’t like it when Dipoto traded for a rental player (free agent after the season) last season in Yonder Alonso. So going out and getting a pitcher like J.A. Happ, who is a free agent after the season, might not seem reasonable. Might need @CurtoWorld for this but looking for comments on shift usage against Vogelbach between MILB and MLB. Specifically, is he seeing a lot more in MLB…wondering if that effects him when he's up. I did consult with the genius that is Rainiers’ announcer Mike Curto, who should get a call-up to the big leagues at some point, to confirm this question. I have seen a handful of Rainiers games the last two seasons and Class AAA teams consistently shift on Daniel Vogelbach like they do at the big league level. Most teams are now using shifts at all levels of the game. The Mariners do it not just to get batters out, but also to get their players comfortable playing in them on defense and their pitchers used to pitching with them. Vogelbach’s difficulties at the MLB level compared to the Class AAA level is based on the talent gap. He mashes Class AAA pitching because there are fewer pitchers with mid- to high-90s fastballs and explosive breaking stuff. Also MLB pitchers can command that increased stuff more consistently, which is why they are in the big leagues. An opposing scout felt like pitchers with fastballs 94 mph and up could take advantage of Vogelbach’s swing, approach and body type. In 314 Class AAA games over three seasons, he’s hitting .290 with a .906 OPS. In 47 MLB games over three seasons, he’s hitting .196 with a .595 OPS. But to be fair, the sample size on Vogelbach as a MLB hitter is still too small. He’s simply not had enough consistent day to day at-bats to know what he is or isn’t as hitter at that level. Part of that is due to the Mariners’ roster and part of it is due to his own limitations on defense. There’s a reason Seattle went out and got Ryon Healy this offseason. If Vogelbach were playing on a team in rebuild mode like the Royals or Orioles, they could run him out there for a 450 plate appearances without interruption or fear of being sent down. That would give you a better idea of who Vogelbach is or isn’t. Until then, he’s just a guy mashing Class AAA pitching and stuck there till September. Do you consider Crown Royal Regal Apple real Crown Royal? If you had twin boys, would you name them Zeus & Apollo? Who would it take for the Mariners to consider putting Kyle Lewis in play? No. It’s a dessert whiskey. If I had twin boys, I would name them Ryan and Ryan II. I think anyone is in play with Dipoto. No one is untouchable. Lewis’ knee issues have taken years off his career, sidetracked his path and lowered his prospect status. The Mariners would consider moving him. But it would have to be for frontline talent under club control for multiple years. Who on the mariners has your favorite and least favorite walk up music? I’m not going to criticize a player’s choice of walk-up music too much because they all have their own reasons for their selections. Heck, Mike Zunino doesn’t even choose his own walk-up music. He lets the bullpen guys choose it, which started last season. My favorite has to be Ryon Healy’s use of Blackstreet’s “No Diggity.” He used that when he was with the A’s and hadn’t used it all season with Seattle. But he brought it back on Sunday and drove in five runs. So I guess it’s going to stay for a while. It’s a song that reminds me of college spring break and it gets the crowd to sing along. And yes, I’m also biased toward that as favorite because Anna Kendrick sang it in Pitch Perfect. He’s not using it anymore. But for a stretch last season, Cano was using Ed Sheeran’s “Shape of you.” Really? A sappy love song? I actually asked Cano if he had lost a bet and had to use that for his song. He was not pleased with my question. And the greatest walk-up song of all time will always be Chipper Jones using Ozzy Osbourne’s “Crazy Train.” That basically made walk-up music cool. What’s your favorite Cody Jinks song? What accomplishment are you most proud of? Can’t be work related. Well, there was that time I didn’t eat the free ice cream in the press dining for an entire four-game series in Houston. That’s not as easy as you think. But that is sort of work related. Two stand out — successfully going to college for 7 1/2 years and still not being a doctor or a lawyer. My experiences of student teaching in high school made it all happen. The other was successfully guilting my parents into buying me a yellow lab puppy for my 29th birthday and convincing them the best name for him would be Yellow Dog. On a scale of 1-10, how upset are you that there will be a Magnum P.I. reboot? Infinity. There is no reason to remake perfection. And I refuse to acknowledge that this will happen. I hope it gets cancelled after one show.